The following comments about attractions in Santa Monica have been posted from individuals. We believe that the best reviews of Santa Monica, California (CA), CA USA are written by travelers and holiday makers who have experienced Santa Monica first hand and want to share their thoughts. Can you share yours? Please help us expand this section of our Santa Monica World Guide. 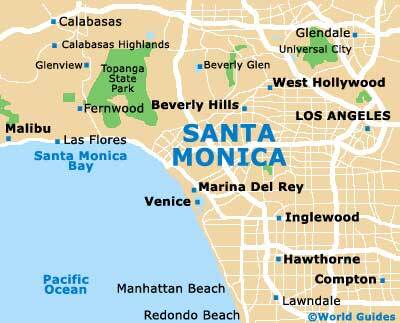 Let us know what you think about the attractions in Santa Monica, California (CA) USA. Submit comments about Santa Monica attractions here. The Santa Monica Pier is one the Colorado Avenue and is much more than just a pier, it is a family theme park, Pacific Park. There is a carousel here from the 1920s, and a gigantic Ferris wheel, which towers high above the Californian beachfront. We went on the big wheel and it was a brilliant memory - a very special part of our holiday, because I'd seen so many pictures of it in the brochures. The rides do become really busy though and we had to queue up for ages for some. The Santa Monica Pier is coming up for its 100 year anniversary, so I guess there will be some partying that night. Los Angeles is so close to Santa Monica that we thought we be brave (or stupid) and drive there to visit the Universal Studios. It was certainly congested when we got there and managed to park up - finally. Everyone in LA seemed to be driving on that day. We decided to take the studio tour and loved the classical, like Jaws and when the Red Sea was parted. The Universal Citywalk had some nice shops and places to eat out. My favourite rides hen the Back to the Future one (I just loved those films) and the newish Shrek 4D, which was nice and long, and worth the wait. Please note that these Santa Monica, California (CA), CA USA comments and reviews are posted by individuals and are not necessarily the views of World Guides.